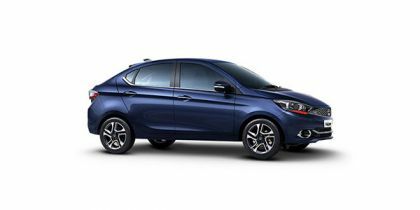 Tata Tigor price starts at Rs.5.48 lakh (Ex-Showroom, Delhi) and the top end variant Tata Tigor XZ Plus Diesel is priced at Rs. 7.64 lakh (Ex-Showroom, Delhi). The Tigor comes with three engine options: a 1.05-litre 3-cylinder turbo-diesel engine, a 1.2-litre 3-cylinder petrol engine and the JTP-exclusive 1.2-litre, 3-cylinder turbo-petrol engine. All the engines are paired with 5-speed manual transmission. The non-JTP petrol is also available with a 5-speed AMT. With the 1.05-litre diesel, you get 70PS of power and 140Nm of torque at your disposal. Yes, that’s not a lot and you feel the diesel Tiago running out of breath pretty quickly. But drive it in a relaxed manner and it will reward you with some stellar efficiency. Pick the 1.2-litre petrol , and that has 85PS/115Nm to offer. What’s more, you also get to opt for a 5-speed AMT instead of the manual. And the automatic doesn’t hit efficiency at all. In fact, it fared better in our road test. While the manual returned 15.26kmpl (city)/21.68kmpl (highway), the AMT surprised us with 16.04kmpl (city)/22.03kmpl (highway). If your idea of driving is hitting the redline while your exhaust wakes up the neighbours, Tata’s got the JTP. It’s amongst our favourite sub-Rs 10 lakh driver’s cars. And if you can trade efficiency for fun, we highly recommend getting one. Q. Which is better between Tigor XZ and Baleno Delta? Q. TATA TIGOR XZ PETROL, FORD ASPIRE TREND PETROL OR SWIFT VXI WHICH ONE IS BETTER? Value for money,roomy, large boot space is Tigor. Q. I am deciding to buy new sedan but little confuse between Baleno and Tigor XZ? Q. Is this car better than Dzire? Q. Tata service is good or bad? Q. Is Tata Tigor XZ Plus model is better than Aspire Trend Plus?